Though this is more geared towards men fashion and lifestyle, among other things, I find myself having trouble discriminating against the leaders of the industry as a whole. Daphne Guinness just recently caught my attention and I love to discover new artists of our generation. What she has done not only since the suicide of Alexander McQueen but throughout her years as an important figure in the expansion of designers who aren’t afraid to show their view of the world (i.e. Isabella Blow, Alexander McQueen) has been pretty insane. 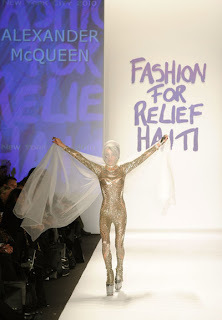 Needless to say this photo of her in the Haiti Fashion for Relief show at the 2010 Mercedes-Benz Fashion Week, in which she (among other models) paid their dues to the late McQueen, encompasses my idea of her and I’m still coming down from the high that is this amazing heiress. That being said, this is kind of what’s been going through my head since discovering exactly who she was just a short time ago. I think for us guys to really understand just how fashion, men’s and women’s alike, is such an important aspect of one’s personality we must dig into the other side and see how even female-only designers impact how we get to express ourselves.